Does VRO/VRA exam available in English or Telugu? Re: Will the question paper of VRO is in English or Telugu? If you want to work as Village Revenue Officer,You should have a grip on Telugu.You should read all the Grants and Schemes read in Telugu.Because all forms and Schemes,You should explain in telugu. So that is the main concept to paper is provides in Telugu. Sorry Aspirant,Questions Paper of Village Revenue Officers in Telugu Only. This Exam consist 100 Questions for 100 marks. This Exam conducts in Andhra Pradesh State only. Total 100 Questions of this exam in Telugu only. Questions are Multiple Objective Type Questions.Only You should mark or round up the questions only.You don't write any telugu words. Dear,you want to work as Village Revenue Officer,You should have a grip on Telugu.You should read all the Grants and Schemes read in Telugu.Because all forms and Schemes,You should explain in telugu.So that is the main concept to paper is provides in Telugu.Sorry Aspirant,Questions Paper of Village Revenue Officers in Telugu Only.This Exam consist 100 Questions for 100 marks.This Exam conducts in Andhra Pradesh State only.Total 100 Questions of this exam in Telugu only. Sir,Village Revenue Officer,You should have a grip on Telugu.You should read all the Grants and Schemes read in Telugu.Because all forms and Schemes,You should explain in telugu.So that is the main concept to paper is provides in Telugu. Questions are Multiple Objective Type Questions.Only You should mark or round up the questions only. Dear,You should have a grip on Telugu.You should read all the Grants and Schemes read in Telugu.Because all forms and Schemes,You should explain in telugu. 60 questions contains in General Category of 60 marks and covers 60% of total marks. 30 Questions contain in Arithmetic Skills of 30 marks and covers 30% of total marks. 10 questions contain in Logical Skills of 10 Marks and covers 10 % of total Marks. You must pass Intermediate from AP board. wat are the duties of a vro, wat are the possible questions to be asked in the interview? Village revenue officer examination is done to recruit students who have completed class 12th in the VRO post .V.R.O have 42 different functions and he work under the Tahisildar and District Collector. The main work of VRO is to administrate villages under it in a right way .He submit reports of these villages to the Tahisildar and District Collector. Since the examination is conducted in the Andhra Pradesh and the native language of AP is Telugu .So the written examination is conducted in Telugu medium only . So the students who are thinking that the written examination is in English medium too then sorry to say but the examination language is Telugu only . The last date to apply for the examination was 30 december 2011 which means that you can not apply for the VRO exam now . You should not be less then 18 years and more then 34 years if you come under general category . 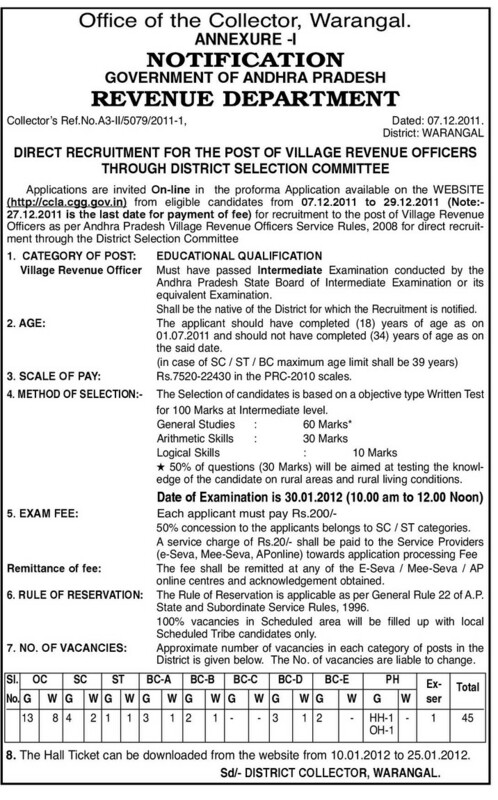 - The medium of exam paper for Village Revenue Officer Post for Andra Pradesh State will be in TELEGU. - The chance for conducting the exam in English language is very less. 1. Logical Skills : this section is of 10 marks. 2. Maths: this section is of 30 marks. 3. General Knowledge: this section is of 60 marks. - Total marks is 100. - Exam time: 10.00 am to 12.00 noon. VRO Examination paper is in Telugu Language only . because You have to work in villages only. some times you have to solve problems and all forms are at Telugu Language only. This exam only for AP citizens only. candidate should know telugu language is must . But may Be this year both languages available i think. the exam willbe in telugu only ..